Enter devices and printers in the Search box on the taskbar. Then select Devices and Printers to display the window shown. 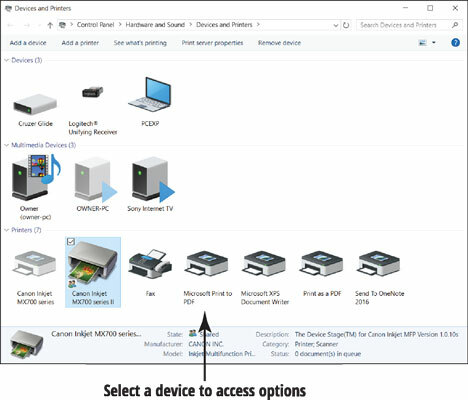 You can open the Devices and Printers window from the Connected Devices category of the Devices window. To do so, scroll to the bottom of the Connected Devices category and select Devices and Printers. The Device and Printers window shows the devices attached to your computer, including the computer itself, the display (or monitor), external add-on devices (such as a hard drive, flash drive, or memory card), and the mouse. Most of these devices also appear in the Connected Devices category of the Devices app. However, you’ll find options under Devices and Printer that aren’t available in the Devices app, such as settings for devices. Double-click or double-tap the device you want to examine. If a small box is open, close it. If a full-screen dialog box is open, select the back arrow or select Devices and Printers near the top of the window. In the Properties window, select the Print Test Page button. Another window opens indicating A test page has been sent to your printer. If a test page doesn’t print, check that both ends of the cable are plugged in properly and make sure the printer is turned on. Try to print a test page again. For more help, contact the printer manufacturer or the store where you bought the printer, or search the web. If you’re having problems with any device, select the Troubleshoot option on the context menu to open a guided troubleshooting program that will walk you through options for resolving problems with the device. The top of the Devices and Printers window has the Add a Device and Add a Printer button, but you need to use them only if Windows 10 doesn’t automatically detect and install your device. With USB and plug and play, most devices install automatically.